The Roughnecks (3-2) will be plenty busy this weekend, embarking on a divisional double-header road trip. First, they’ll travel to San Diego to take on the Seals (2-2) on Friday night at Pechanga Arena at 8PM, followed by a visit to the Pepsi Center in Colorado Sunday for a 1PM matinee against the Mammoth (0-3). It’ll be a good opportunity for the Riggers to get back in the win column after a 16-10 defeat at the hands of the New England Black Wolves at home on Jan. 12. In their last meeting, the Riggers downed the Seals 9-5 at home on Dec. 28. That game saw goaltenders on both ends of the floor – Christian Del Bianco, and former Roughneck Frank Scigliano – keep their opponents to just four goals each at the half. It took five fourth quarter goals from the Riggers to solidify the victory. Dobbie expects even more of a battle this go around. Needless to say, there won’t be much time for sight-seeing in the sunny city, especially given the Seals’ stellar lineup. “No beach day,” said Dobbie. “It’s a business trip. We’re going down there to take care of business. They’ll also have to get through former Rigger Garrett McIntosh, Brodie Merrill, Adrian Sorichetti and Cam Holding to find the net – not an easy task to say the least. Then, after a day of rest on Saturday the Roughnecks will face-off against the Mammoth for the second time this season. 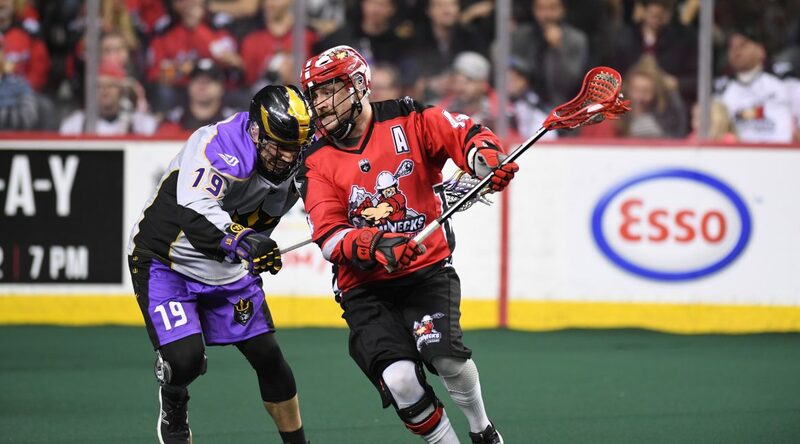 In their last tilt the Riggers defeated the Mammoth 11-8 on Jan. 6. Colorado is winless so far this campaign, but don’t sleep on them. “They started the season off slow, but that doesn’t matter to be honest,” Dobbie said. “I’ve been on that end of the stick with Calgary a few times. We have to be ready to go. Don’t expect the Riggers to come out slow on Sunday, though. According to Dobbie, two games in one weekend is no defence for a loss. “It’s something every team has to go through in this league and they’ve been doing it for years now,” Dobbie said. “I’m not going into this weekend making excuses, our team is young, and athletic, we should be able to manage two games.